Sublime Frequencies is thrilled to present a 2nd volume of classic tracks from Algeria’s popular music history. 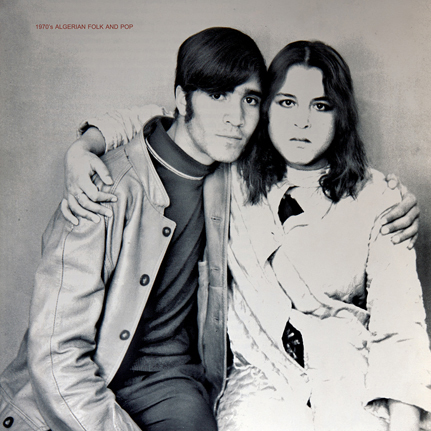 Where volume 1 focused on the early to mid-1970s Rai scene in western Algeria, this album features a variety of pop and folk styles from that same period. From the heavier rock and psychedelic sounds of Rachid & Fethi, Les Djinns and Les Abranis to the haunting folk music of Kri Kri and Djamel Allem and the Film soundtrack moods of Ahmed Malek, 1970s Algerian Folk & Pop documents a key period in the modern musical renaissance of a nation in transition. Most of these tracks are from 45 rpm singles, the key format during the early 1970s before the cassette took over as the medium of choice. Western musical influences can be heard throughout this extremely diverse record yet there is an undeniable Algerian sense of sadness contained here within a more tolerant space in time between two of the country’s most significant historical periods; National Independence from France and the darker times of a brutal civil war yet to come. Compiled by Hicham Chadly. limited Edition LP comes in a full color gatefold jacket; CD edition comes in a digipak. Both formats with lovely images from the period and extensive liner notes by Omar Zelig.